Just because you brush your teeth everyday doesn’t mean that your mouth is clean. In fact, if you skip flossing, you could be missing up to 35% of your tooth’s surface! Can you imagine how much plaque, bacteria, and lingering food that stays in your mouth each night when you forget to—or avoid—flossing? If you don’t have great flossing habits, this post may change your mind about it. 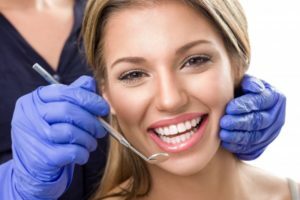 Learn more about why this quick part of your dental hygiene is emphasized so much by your dentist in Long Island City in this week’s blog. As mentioned above, you can miss a significant amount of tooth structure when cleaning your teeth if you skip out on your flossing. This is just the beginning of your problems. The real dental issues start to stem from the plaque and debris that collect between teeth and along the gum line. These materials can harden into a harmful substance known as tartar. Unfortunately, when tartar forms, the only one who can remove it effectively is your dentist. Tartar is still just a catalyst to larger dental concerns like gum disease and tooth decay. Before you know it, your gum health will begin declining and you’ll face inflammation, tooth loss, and decaying teeth. How Can You Improve Your Flossing Habits? The best way to boost your flossing is to simply make it a point to floss once a day. Although it’s a meticulous task because you’re supposed to floss between each and every tooth in your mouth, remember you only have to complete the task once a day so that it doesn’t seem so daunting. Be sure to pull out at least a foot of floss to 18 inches. This provides enough space for you to floss between each tooth and move to the next space of clean floss. Wrap the floss around your fingers so that there is tension and a tight grip, gently moving the floss between your teeth. Be sure to carefully insert the floss so that it doesn’t abruptly cut your gums. Move the floss back and forth slowly, loosening the plaque from your teeth. Try to reach below the gum line if you can. Remove the floss by sliding it back up and pulling the debris from between your teeth. Can Your Dentist Help with Flossing? If you think flossing is a solo task, you’re only somewhat correct. It’s true that completing the task falls on you, but it’s also important to realize that if you need help, your family dentist in Long Beach City is here for you! A local dental practice can help with a hands-on demonstration, give great advice and tips to improve flossing at home, and even recommend products (like a water pik) that can make flossing easier. If you need assistance, don’t hesitate to call us! Here at LIC Dental Associates, we want to help our patients keep their smiles healthy for a lifetime! The best way we can do that is to both provide preventive care and help you improve your dental hygiene at home—your own preventive care. Learn more about how we can help you by visiting our office.